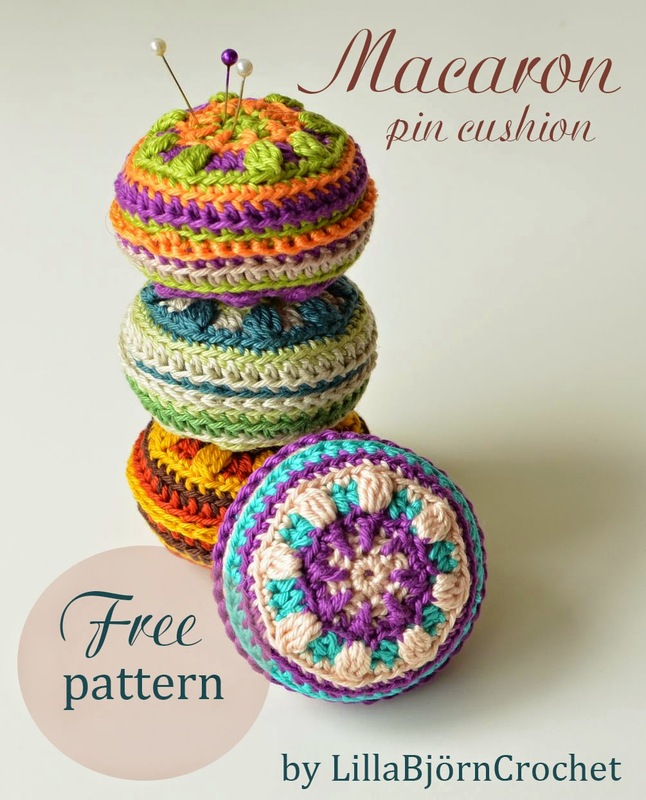 Macaron Pin Cushion – Free Pattern! 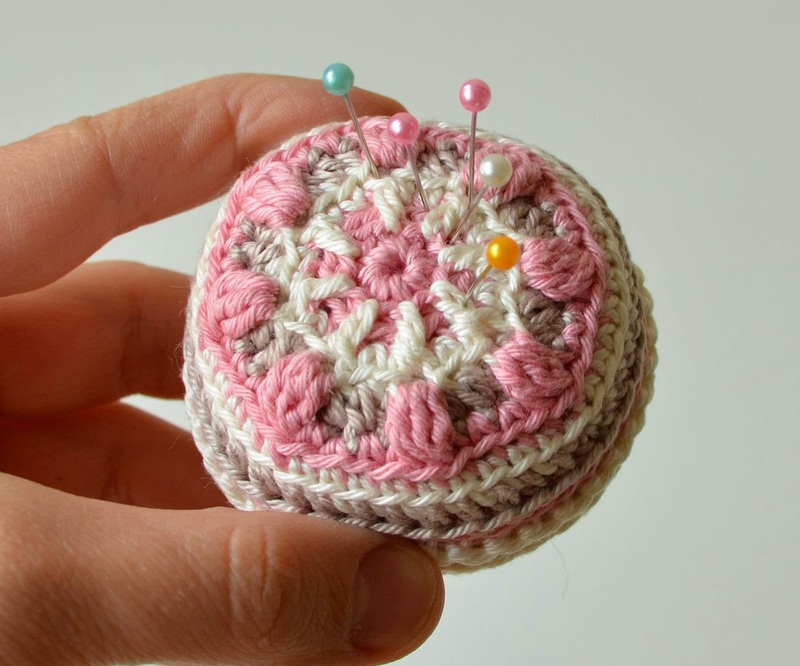 A nice pin cushion is a must have for every needle-yarns-fabric crafter. I have been using a stuffed leg (left from my never finished crocheted bear) as a pin cushion for a very long time. But one day I thought – enough! I need to design something nice, and looking more like a cushion! And I created this small pin cushion. Its pattern is available as a free download. I am not really a lover of sweets and candy eater. If I can choose between a piece of cake and a tasty apple I will definitely choose an apple. I haven’t tried many different kinds of sweets in my life and I am far not a gourmand… I have never tasted French macarons either. But I just love the way they look – so colorful and so bright! I have designed a pin cushion recently and I called it "Macaron" as it has the same shape. Macaron Pin Cushion pattern is available HERE. 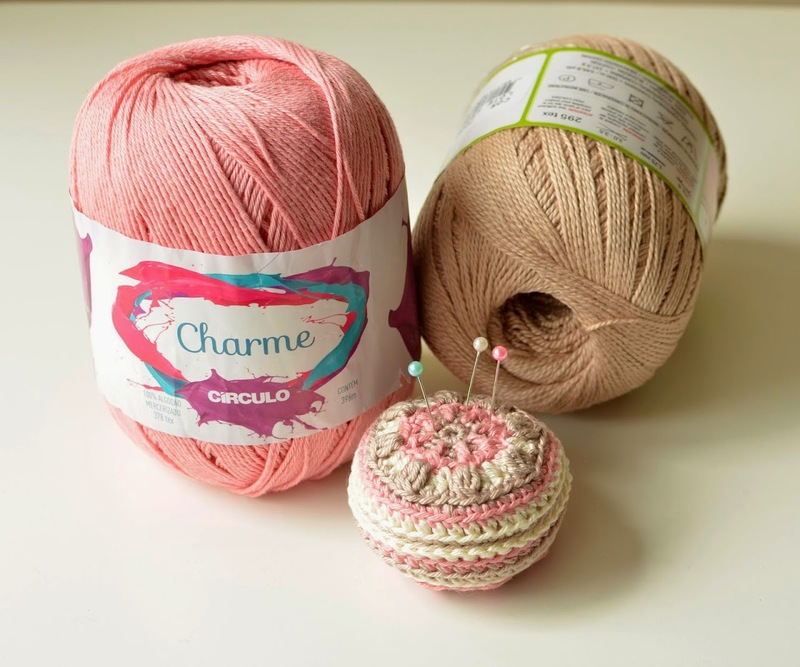 I used pure cotton yarn "Charme" (Sport weight) by Brazilian brand "Circulo" and 2.5 mm crochet hook. But you are free to use any yarn and colors you like. This cushion consists of two shells joined together with a round of single crochet stitches. You can make both shells similar or you can play with your colors and make them totally different, or you may also place chosen colors in another order. You are not limited by Sport weight yarn and you can take any weight. The thickness of your yarn and the hook will only influence the cushion’s size. So if you like big pin cushions you can take even worsted or aran yarns! This cushion is designed in overlay crochet. Stiffer yarns of contrasting colors are usually recommended for this technique. But you can also try other yarns. You will for sure achieve some nice effects. The pattern is very easy to follow. It offers detailed instructions and basics of this crochet technique as well as lots of progress pictures (a few for each round). All stitches are also explained in the pattern and I’m sure that advanced beginners will easily handle it. If you would like to read more about overlay crochet – please, check an Overlay crochet section on my blog. You will find it in a bar in a right corner of my blog page. 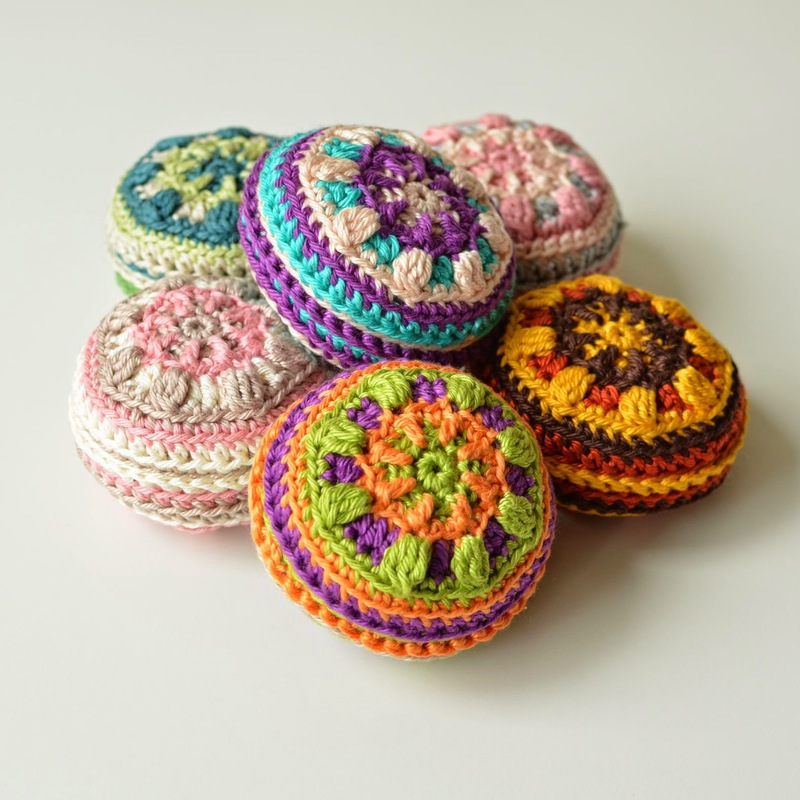 Macaron Pin Cushion pattern offers a great (and free) possiblity to start mastering this amazing overlay crochet technique. Just be aware it is very (very!) addictive! 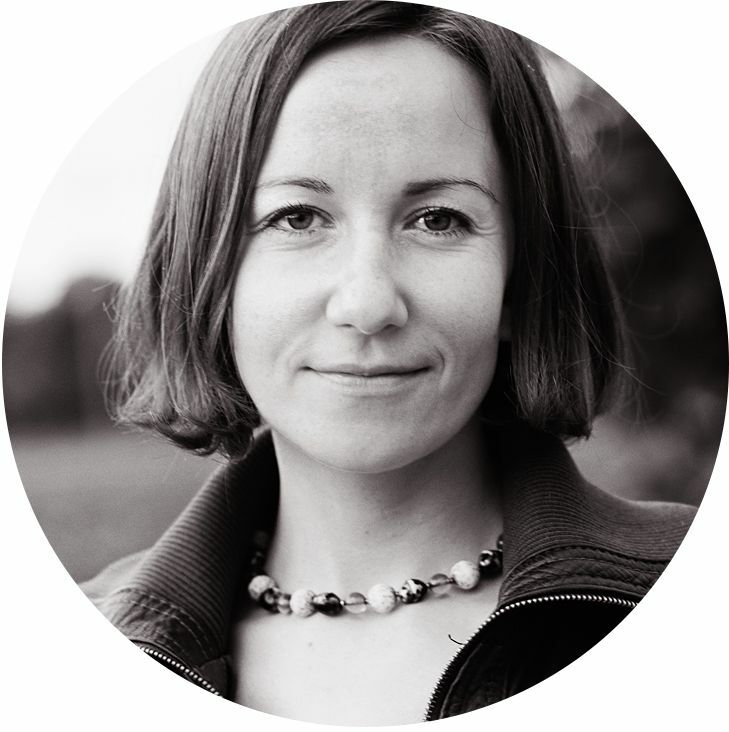 You are great, I love your blog! Kisses from Brazil! Hi! After the confirmation of subscription you will get a "thank you e-mail" with links to the pattern. The first one is to view the file in docs(.)google(.)com. To view it you should have a dpf plagin installed. Once you see the file you will find a download button in the upper menu. But you can also download this file directly from my "thank you" e-mail using the second link. After clicking it the file should start downloading. I hope it helps! Your blog is wonderful! Congrats! Thank you! I am happy you like it here. Wondering if this pattern is available on Craftsy because it seems familiar to me but I can't think of another connection. Thanks, I'm liking most all your patterns! This pattern is available only to subscibers of my blog! So it should not be listed on Craftsy. If you know about it being offered there (free or paid) - please, let me know. I tried and tried to access the pin cushion pattern. I clicked on every link that was available after I received my Thank You email. The pattern was not accessible to me. I unsubscribed because of the difficulty of actually finding the free pattern. Dear Dianes, thank you very much for your comment. I looked into it right now. I tried to subscribe to my blog myself and the whole process worked just fine for me. First you need to type your e-mail address in a subscription form and click the button "Sign-up". This form is available on every blog's page. A confirmation e-mail will be sent to the address you've just provided. You should go into your Inbox, find this e-mail (check Spam folder as well), open it and click the link "yes, subscribe me to this list". After that your subscription to this blog is finished. AND you will get one more e-mail - with 2 links to access the pattern. The first one is to view the pdf-file online (and download it if you wish). And after clicking second link the file with the pattern will be downloaded to your computer automatically. If you got an e-mail with the links but they don't work for you - you can either try to browse it in another browser, or try to open it on another device. Both links worked perfect for me right now... Please, feel free to contact me if you have any further questions. I downloaded the pattern. It was very descriptive and easy to follow. I made two and I love it. Thank you very very much. It's addictive indeed !! Looking forward to learning more. I love your blogs. Thanks again. Subscription is an utomated process. If you singed up AND confirmed your subscription (press "Yes, subscribe me to this list" button in a confirmation e-mail), you were automatically added to the list. And you should have got another, "thank you", e-mail with the link to the pattern. Please, let me know if you did all those steps and if you were able to get the pattern. thnak you! Me suscribí, pero me es imposible ver el patrón. I never received the thank you email, so of course, never received the link for the free pattern. The whole process is automatic. Thank you e-mail is sent out after you confirm your subscription. At least it should work like this. Please, e-mail me (or send a message via message form on my blog) and I will e-mail you the pattern manually. Dear Lady, please be patient with me. I have subscribed to your newsletter years ago. Your little subscription box says I am subscribed. BUT....I cannot figure out where I have stashed the pattern! Could you possibly send it to me again? Love your patterns. Hi Valerie, the whole process is automatic so sometimes it might not work as it should. Can you please e-mail me? I will send you the pattern in reply. Татьяна хочу купить квадратик)как лучше сделать? Your blog is great, I like it very much, if there are more weaving tutorials, it’s perfect. I got my free pattern for these macaron pin cushions and have made one for all my stitch-y friends and family :P So cute and so fun! Also an excellent way to use up scraps of yarn. Thanks again!